When a great brand creates miniature sized versions of their signature products, you know that they’re serious about skincare. There’s nothing I hate more than falling in love with a product range but then going on holiday and having to switch up my products because I can’t buy my usual favourites easily in a travel sized form. Sometimes this is a blessing in disguise but often it is a risk as I never know quite how my skin is going to react to the new skincare products. Also, skincare can be very hit and miss so before I purchase a full sized product, I really like to get my hands on a smaller, more luxury sample sized version first. That’s where NPSA ticks all the right boxes. Beauty Rituals is NSPA’s collection of skin enhancing facial beauty products. There’s 4 steps to the simple routine- step 1 is to cleanse to draw out impurities and to clarify the skin to get rid of make up and dirt, step 2 is to exfoliate to slough away dead skin cells, refine pores and smooth the skin, step 3 is to treat to condition and replenish the skin and step 4 is to moisturise to restore, nourish, soften and protect the skin. The great thing about NPSA is that there isn’t just one products that you can use for each step, there is actually a choice of four products for steps one to three and a choice of eight products for step four so whichever formula you prefer, you’ll be able to find a product to suit you. I have been trying out a product from steps one, two and three, all of which are a smaller, travel size of 50ml compared to the full sized products and are available to buy in the Beauty Rituals Box that NSPA offers so they are great for travelling or just trying out the products before committing to the full size. The first product I have been trying out is the Melting Cleansing Gel which is actually a luxurious gel that turns into a cleansing milk as you’re using it. 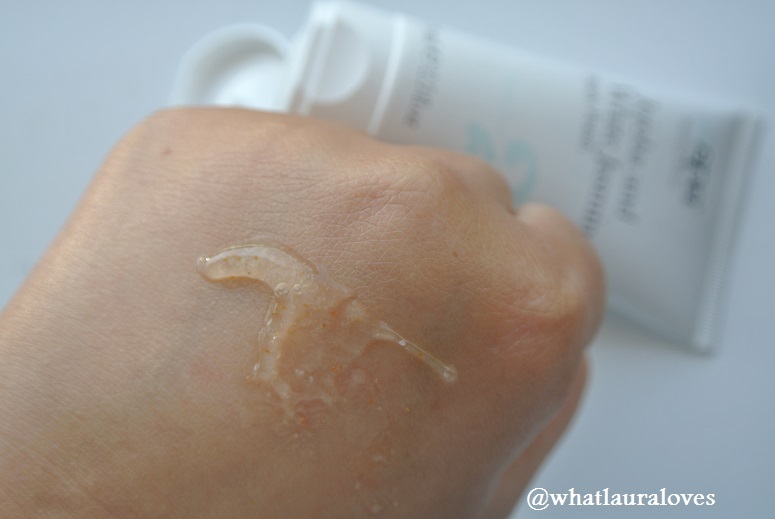 This is step one in the beauty rituals routine and is really simple to carry out- simply massage it into dry skin at first, using small circular motions to work the gel from the chin up to the forehead, at this point the product is still a gel formula, then wet your hands with warm water and repeat the massage action to transform the product from a gel into a cleansing milk and then rinse thoroughly with warm water. It leaves my skin feeling and looking clean without drying it out and making it squeaky clean. It doesn’t hurt my eyes or leave a film on my skin after use. It really makes my skin look fantastic. I don’t use this to remove my make up as I prefer to use a water based cleanser on a cotton pad first and then use this but it can be used to remove make up if you prefer that method. The NSPA Melting Cleansing Gel is really gentle and is suitable for all skin types, even including sensitive skin. It contains grape seed oil which dissolves make up and impurities and can help to improve the radiant appearance of the skin as well as ginseng which is known to be moisturising, vitamin E which is an anti oxidant and avocado, apricot and neroli oils which nourish skin. This is available in a 125ml bottle for £6.00 in Asda or in a 50ml bottle in the Beauty Rituals Box. The cost of this cleanser is just ridiculous really. It is such a great product with such a very low price in comparison to how good it is that I really don’t see any need to spend more money on the higher priced brands. It is honestly THAT GOOD. I will be buying the full size of this. The NSPA Hot Cloth Polish is a really quick way to deeply clean and exfoliate your skin and this is step two of the routine. It contains cocoa butter and sweet almond oil which help to dissolve make up and vitamin E, avocado, apricot and neroli oils to soften and moisturise the skin. Now you might be wondering why I’m suggesting a further cleanse of the skin after completing step one which is the cleansing stage. Well, using a cleanser alone whether you’re using a water based lotion with a cotton pad, a cleansing milk or gel over the sink or, dare I say it, a cleansing wipe, does not remove the most deep set make up and dirt so you really need a second cleanse to deeply clean the skin. The Hot Cloth Polish is quite a thick cream that feels very luxurious and rich and it smells incredible, a little fruity, floral and fresh. After completing step one, I dry my face and then apply a small dollop of the Hot Cloth Polish to my skin, massaging it in circular motions in the same way as I did with the Melting Cleansing Gel. Then I run a muslin cloth under the hot water, wring it out and then place it over my face for a few sections before using a polishing motion to remove the cream from my face. The use of the creamy cleanser in conjunction with the muslin cloth really polishes my skin and makes it look incredible. It has a texture too it so its not like a wishy washy cloth but at the same time it is a gentle enough combination to use everyday. It really gets rid of my dead skin cells and leaves my skin looking really bright, smooth and even. It feels smooth after use and I find that other products I put on my skin following this really sink in much better than when I don’t use it. This is £7 for a 150ml tube but it is currently on special offer for 2 for £8 in Asda and it is also available in a 50ml size in the Beauty Rituals Box. In both the Beauty Rituals Box and in the full sized product box you do get a muslin cloth to use with this. Out of all of the products I’ve tried, this is the one that I would say gives all of those higher priced brands a run for their money. This is just fantastic! I would absolutely 100% buy the full size of this. The NSPA Illuminating Beauty Serum is step three of the beauty ritual and has been described as ‘sleep in a bottle’ which I would completely agree with. I apply this all over my face after steps one and two and if I am having a make up free day then I will apply a moisturiser or if I am wearing make up that day then I will apply it directly after applying this serum. The reason why I do that and skip a moisturiser is that I find the beauty serum to be so softening on my skin, brightening as though I’ve had a restful nights sleep and it leaves it with a smooth, fairly matte texture which is the perfect base for make up. It makes my skin glow from the inside and it looks so naturally healthy when I’m wearing this. I absolutely LOVE it. The NSPA Illuminating Beauty Serum contains natural vitamin E and ginseng for their moisturising properties (they’re also brightening too, brands like Origins use ginseng in some of their most popular brightening products), maca root to boost the skins radiance and grapeseed oil which gives the skin some luminosity. This is £7 for a 50ml bottle but it is currently on special offer for 2 for £8 in Asda and it is also available in exactly the same 50ml size in the Beauty Rituals Box but in different packaging. Bathing Rituals is a range of body care products that were designed by the spa experts at NSPA so that you can create your own bespoke body care regime at home. Like with the Beauty Rituals product line, there are three steps to the Bathing Rituals routine each with a choice of products for each step. The three steps consist of the cleanse to remove dirt and impurities for step 1, exfoliate to buff away dead skin cells and to smooth the surface of the skin for the second step and the third step is to moisturise to restore, nourish and hydrate the skin. 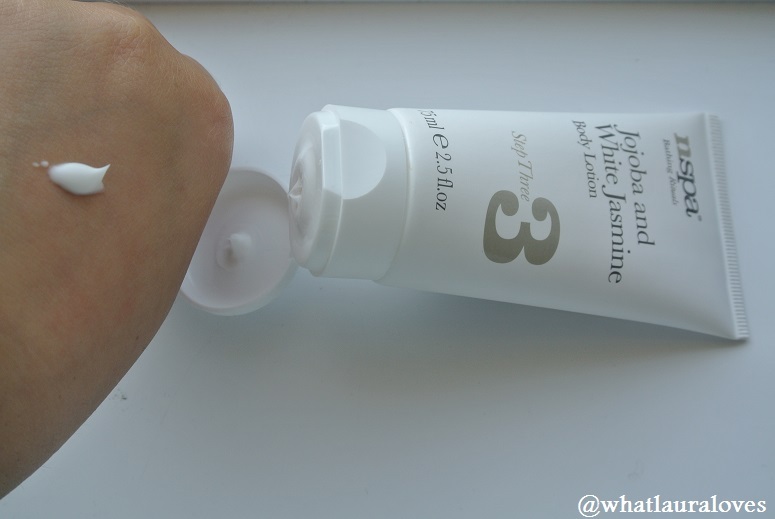 I’ve been trying out a couple of products from steps two and three in the jojoba and white jasmine scented line. The NSPA Jojoba and White Jasmine Body Polish is the second step in the Bathing Rituals Routine and is probably my favourite step as I really enjoy using a good body scrub. This body polish dispenses as a clear gel like formula filled with little grains of walnut shell. I like to wet my skin first, then turn the shower off and start to rub this over my body in circular motions. I find that it feels the most abrasive when used in this way which is how I like it. The body polish leaves the skin free of dead skin cells so it looks bright, smooth and perfected and it is super soft too. That’s thanks to the jojoba and rose hit oil and sandalwood essential oil which not only helps to soften the skin but it makes it smell good too. This line has quite a floriental fragrance and it layers really well. 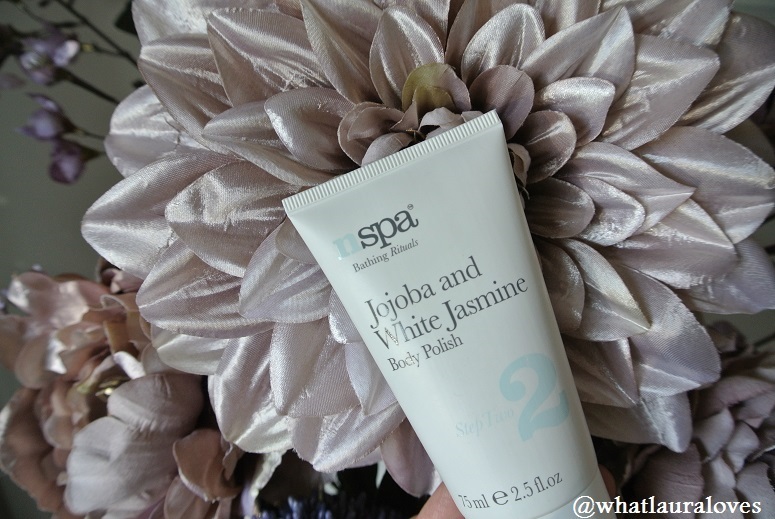 The NSPA Jojoba and White Jasmine Body Polish is £2.95 for a 225ml tube but it is currently on special offer of 2 for £5 in Asda and it is also available in a 75ml travel size in the £10 Weekender Bag on the Nirvana Spa website. The NSPA Jojoba and White Jasmine Body Lotion is a light weight, quick to sink in body lotion that layers beautifully when applied to dry skin after using the body polish above as it has the same gorgeous floriental fragrance. It feels very silky and high quality when applying it and it leaves my skin feeling really hydrated and nourished. The lotion contains shea butter, rose hip and jojoba oils as well as sandalwood essential oil and conditioning pro-vitamin B5 which are great for moisturising even the most thirsty of skins. If you want silky soft and smooth skin in an instant then this body lotion is a fantastic option. The NSPA Jojoba and White Jasmine Body Lotion is £5.00 for a 250ml bottle and it is also available in a 75ml travel size in the £10 Weekender Bag, both from the Nirvana Spa website. I’ve thoroughly enjoyed using all of these products and I would recommend them all to you, particularly the face products from the Beauty Rituals line as they’re absolutely amazing quality and really rival the higher end brands. 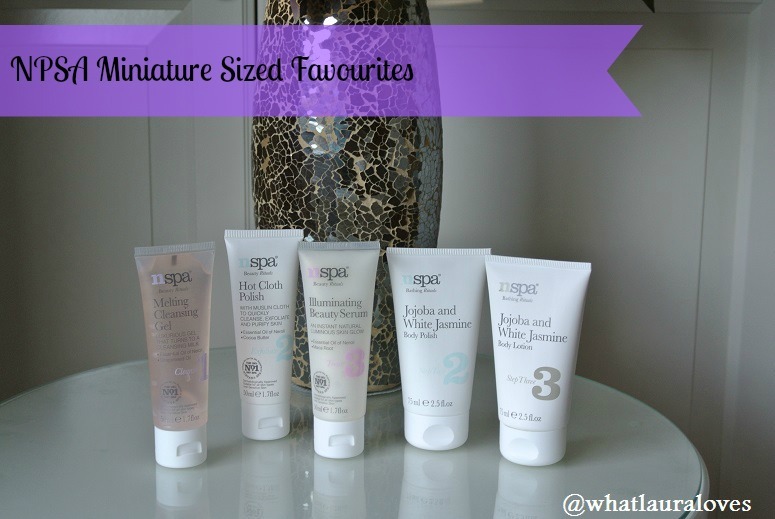 I’m definitely going to purchase the full size equivalents when I’ve ran out of similar products in my collection! What NSPA products have you tried? What did you think about them? I have this exact kit 🙂 lovely review hun… hope my review will be live soon as wellI have just posted a hair styling post if your interested :DThe Jewel Beauty Blog – A friendly beauty and lifestyle blog! Your post was very interesting for me to read, Laura. In the US, I think nspa has only launched their body care line. And the scents are different and more basic here: raspberry, mango and coconut. I believe there's shower gel, body scrub and body butter…maybe one other product too. The facial skincare range sounds wonderful. Hopefully, it'll make it here one day!